OK, here it is, my appraisal of what went well and what didn’t from this last weekend. To start off with I did everything right. I ran a good solid race, listened to my body (however achy it was!) and ran a sensible race. 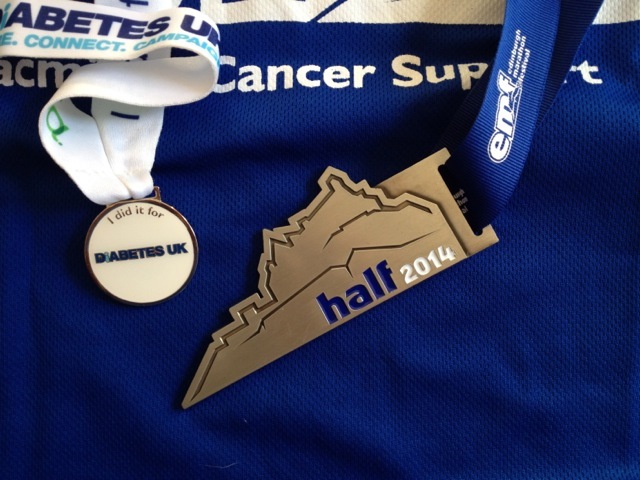 I finished and did so strongly, even if some parts of my race were quite tough going. 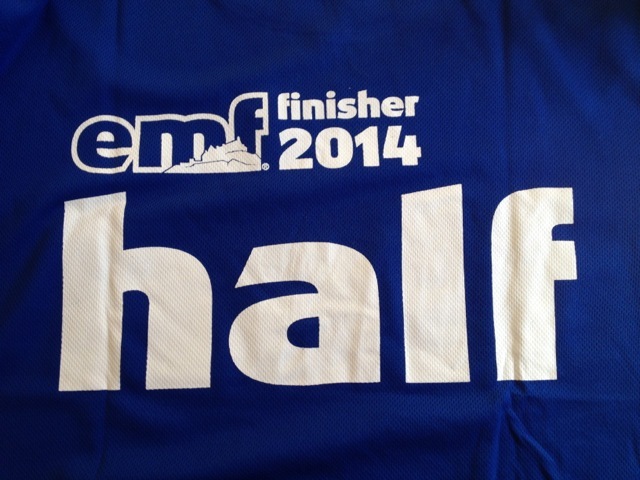 So, what was my experience of the EMF Half? It started very early on Sunday morning with a 4am start. Far too early a start in my opinion. I didn’t feel as if I’d had enough sleep; it had rained heavily all night and the noise wasn’t as relaxing as the pitter patter of gentle drops on the canvas – it sounded more like a drum being played all night! After a breakfast of toast and jam and a cup of tea, we set off at 5am for the Park and Ride. When we arrived (a good 30 minutes early) it was lightly raining. The bus was meant to arrive at 5:45am and leave at 6, but didn’t arrive until after 6. We asked the driver about the tickets and if my husband would stay on this bus or have to get another to get him to the finish. “No idea!” said the driver, who looked completely hassled. He said he hadn’t even got an idea where he was going and was going to have to follow the bus in front. Great. You can imagine how relaxed I was starting to feel. 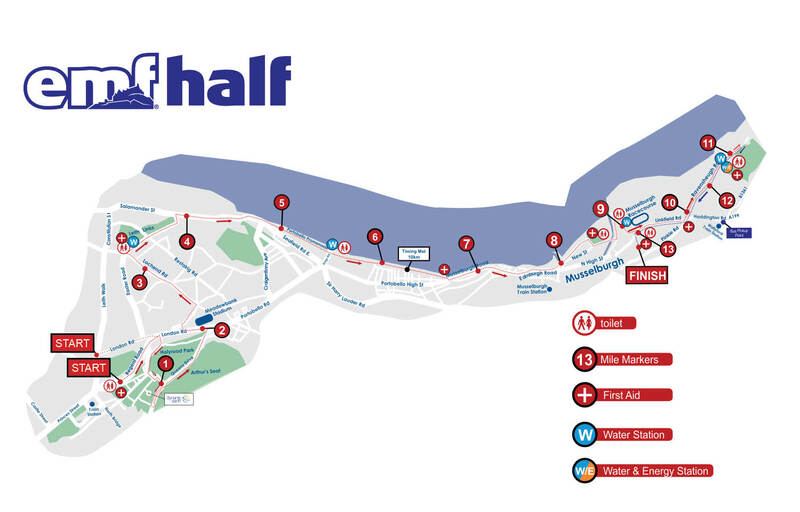 Our information pack had stated that our bus would go on a circular route, collecting runners from three Park and Ride destinations, starting with ours at Craigmillhall at 6, around to Sheriffhall at 6:15 and then to Straiton at 6:30, arriving in the city centre at 7am. Instead our bus and the one in front went from Craigmillhall directly to the city centre. When we arrived, after a very strange roundabout route, at Market Street we were told to disembark and make our way to the start. It was 6:30, we had an hour and a half to wait in the rain with no shelter and nowhere to go but the start. Luckily the start was clearly signposted; things were looking up. However, once at Market Street there were no other buses, no information and no one around to ask about the shuttle service to the finish. My poor husband was looking very concerned; maybe we could ask at the start? The walk to the start took about 20 minutes. We wondered if we’d have been better leaving our car in Leith and catching an ordinary bus to the top of Leith Walk. It would have saved us a fortune (we pre-paid £16 for our two tickets) and we would have known exactly where we were going and at what time we needed to leave. We could have maybe enjoyed one extra hour in bed! Of course, at 6:50 the start was fairly empty – all the sensible people were still having breakfast! I did manage to make use of the portaloos whilst there wasn’t a queue, although as they’d been open all night it seems that the party crowd had taken advantage and the loo I chose stank of sick. Fab. My day was getting better and better. We were told by Race Crew that my husband could catch a service bus to Musselburgh at the bottom of the hill, so after checking out the bus stops we felt a little better. He later told me that the bus stops had all been closed and the only way he managed to get a bus was because a little old lady who was also waiting for it stepped out in front of one and made the driver stop! He promises me that he didn’t push or even gently coerce her. The rain started to get heavier and by the time we were asked to get into our pens it was really chucking it down. And so then they decided to delay the start for 15 minutes! Excellent. You have 10,000 wet and cold runners waiting open to the elements and you delay the start! When we eventually got away the rain had lightened a bit, but it was still quite windy. I had recollections of the last time I ran in Edinburgh at a half marathon – the infamous Rock’n’Roll 2013 disaster when the wind and rain was that bad it blew portaloos over and wrecked a concert stage. Surely I couldn’t be twice jinxed? I had my Jeff Galloway Half Marathon app set for 3 minutes running and 1 minute walking and had decided that if I felt good after a few miles I could increase the running or decrease it if things started to go bad. I was determined to finish. 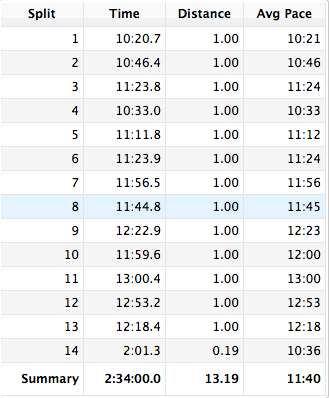 Mile 1 was a healthy 10:21 and I felt that I was running well, although the route seemed to be really crowded at times. My third mile arrived after 32:31 minutes and I was comfortable with that, so I tried to adjust my app. I was easily coping with 3:1, 4:1 would be good. However, with all the rain, my armband face was misted up and I couldn’t properly see the phone screen. I clicked what I thought was 4:1 and carried on. I realised that I something was wrong when at mile 4 I tried to have half my gel and couldn’t manage just half of it on my walk break. I stopped and checked; I clicked past 4:1 and chosen 4.30:30 – no wonder my walk breaks seemed short! By mile 4 we were heading along the promenade and into the wind. I don’t mind the rain really, but the wind just zaps the strength out of your legs. We had 7 miles of the wind blowing on our faces, slowing us down. My Garmin splits tell the full story; I just got slower and slower. My 10k split was 69:05. My slow times weren’t helped by the fact that in a couple of places we had to slow down to a walk in order to cross roads through very narrow gaps whilst the traffic was being held up. It was really frustrating! Once we’d reached Musselburgh at mile 8 I wondered where we were going to be heading – the finish was just a mile from where we were. The route took us tantalisingly close to the finish and lead us away for two long miles before turning us round for the last two miles. What we had was two lanes of traffic, us heading away from the finish watching those who had rounded the turn and were ahead of us running on the home straight. It was demoralising; I had no idea how far I needed to go before I had to turn – the road seemed to stretch on forever. Eventually, half broken, I made the turn. It was better being on the final stretch, far better looking at the anxious faces of the people on the other side than be one of those anxious faces. It was even exhilarating when, at mile 12, the elite marathoners passed us on their way out. I am so very pleased that I had made the turn before the elite men passed by! They didn’t get a chance to overtake me – I was able to clap them on and get a slight lift from their wonderfulness. With half a mile to go I was struggling. 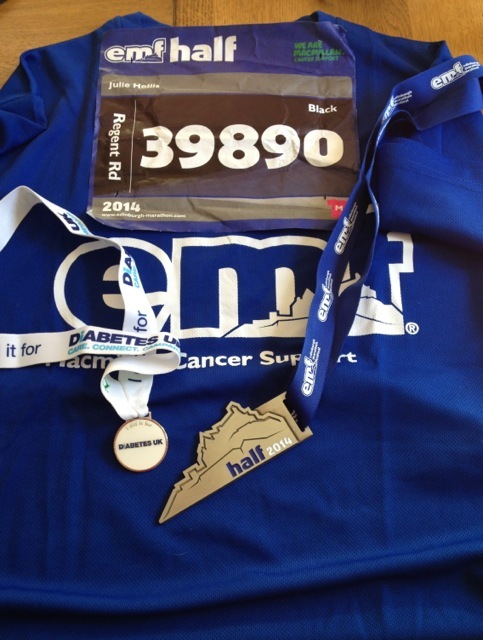 I think I’d hit the wall and I was half running, half walking – knowing that I only had a few hundred metres to go. All of a sudden I made a left turn and there, like an oasis, was the finish! Amazingly I found my legs and sprinted down the bouncy castle like matting to cross the line in 2:34:17. I had come 8773 of 9652 runners. There were a thousand people slower than me. Awesome! Once I’d crossed the line I went to get my medal and goodie bag. Despite the fact that the organisers had asked for T-shirt size, there were no medium T-shirts left, only XS, L and XL. I hunted about for a bit and then decided that a large T-shirt would do. I got my photo taken with my medal and wandered out to find my husband. We’d decided to meet at the family reunion section, but neither of us could find it. Instead I headed for the beer tent, knowing that he wouldn’t be too far away from a free beer sign! I wanted to find the Diabetes UK tent and say hello. 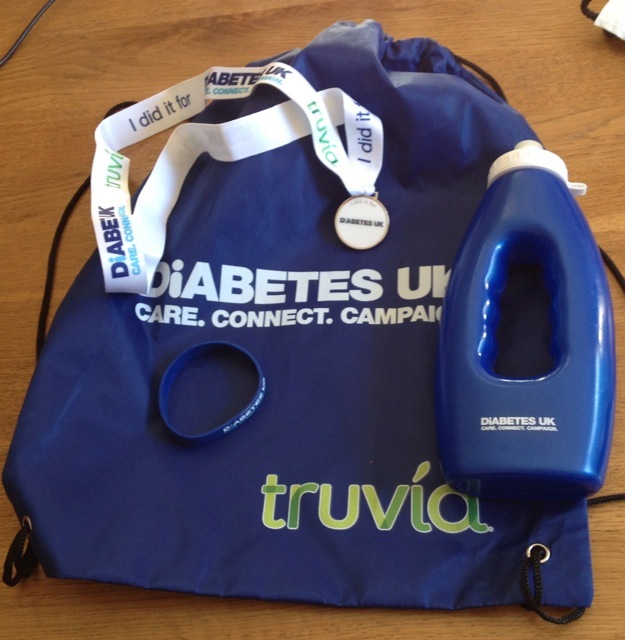 There were five main charities and many more smaller ones, Diabetes UK being one of the smaller ones. I didn’t get a post-race massage, but I did get thanks, an additional medal and a goodie bag. They’d even laid on sandwiches, fruit and water. It was getting on for 11am and we headed away to get the shuttle bus as the last one left at 12. It was a tough walk, mostly uphill, to get to the park and ride car park. At one point I had to stop; my poor muscles were weeping! Once we reached the car park we joined a massive queue, not knowing where the queue was heading or what we were queuing for! There were a few buses parked up, but no one was there directing the queue. It turned out that the two buses we were queuing past were our buses, but no one knew until we overheard the driver saying where he was heading next. All of a sudden his bus filled up! The rest of the day was spent relaxing and eating and I’m happy to report that I suffered no real ill-effects of my run. I went for a walk along the prom this morning, met a marathoner still proudly wearing his medal 24 hours later, and I’m feeling fine. You’d never really know that I’d run a half marathon the day before. I wondered if I’d really pushed myself hard enough, thinking that maybe if I’d pushed harder I’d be hurting more today, but I think I just prepared myself well and did all the right things afterwards. I stretched immediately, had a post run soya milk shake (for muscle repair), ate an apple (anti-inflammatory properties) and continued to stretch out gently throughout the afternoon. I know that at miles 12 and 13 I could give no more, so to think I’d not tried hard enough is just silly. I think I was a victim of the weather again, sadly. One day I get another ideal race, like the Great North Run was, and get close to beating that PB. The back of my technical tee. Will I do this race again? The answer is simple. No. For so many reasons I didn’t enjoy this experience. It was far too busy a race, the route was far too narrow in places and in some sections we were actually stationary. The getting to and from the start and finish was a total nightmare. It took far too long and was far too disorganised. The race itself was great – the weather couldn’t be helped. I’m destined for smaller races, even if I’m last I think! We’re safely installed in our wee trailer tent in the outskirts of Leith, just up the road from tomorrow’s race route. Today we did a dummy run to the nearest Park and Ride, which is 30 minutes away. It’s as well we did the dummy run because the satnav took us through a housing estate and a retail park, adding another 30 minutes to the journey! At least we know where we’re going! I’ve prepared pretty much everything, I think. I’ve got my Camelbak full of 0.75 litres of water and a tablet and a half of High 5 Zero hydration. My 33Shake chia gels are hydrating and I’m currently charging my Garmin. All that’s left is for me to charge my phone. Oh and sleep. The bus is collecting us from the Park and Ride at 6am, taking us via all the other park and rides to the start at Holyrood Park for about 7am. The race starts at 8am, so I’ll have a bit of waiting around, although they want us in our corales by 7:45am. Working backwards we need to leave the campsite at 5am; we shouldn’t have any delays, but I’d rather being sitting in the car waiting than rushing about trying to get there! 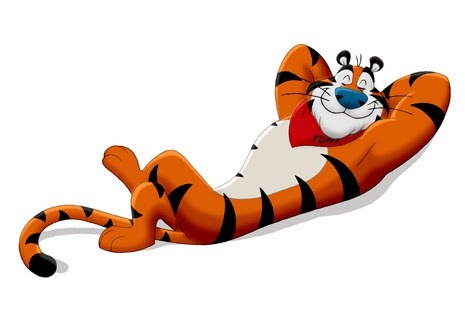 I reckon we need to get up at 4am to have breakfast and get ready, so I need to go to bed in about 25 minutes if I’m to get 8 hours sleep! Next time I’ll look for a later starting race! It’s just started raining. It’s only light rain and it’s supposedly meant to stay that way until tomorrow afternoon, at which time we might be enjoying a thunderstorm. I don’t mind running in light rain. I just hope that the wind stays fairly calm. The last time I ran a half marathon in Edinburgh it was so windy the portaloos were being blown over and the after race concert had to be cancelled because the stage had been ravaged by gusts! Light rain would actually be a blessing! I’ve had a homemade spaghetti bolognaise, high in carbs and protein, low in fat and salt, and I’m drinking a lovely apple, mango and passion fruit sparkling juice from M&S. I’m being as sensible as I can be; I’m taking as few chances as I can! I need to feel relaxed and prepared. So next time I write I’ll have run another 13.1 miles, collected another medal and be wearing the technical tee-shirt. I’m looking forward to running this race. I’ll give it my best.